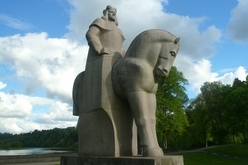 Statue of Vytautas the Great was built from pink granite by sculptor G. Jokūbonis and architect V. Čekanauskas. The sculptor embodied ideas expressed by a majority of Birštonas’ residents - to bring Vytautas and his horse back to their hunting-ground. Sculptor G. Jokūbonis created a sculpture were Vytautas’ figure blends into a horse figure, this way the sculptor emphasizes Vytautas’s abilities to fight and desire to act. Granite for the statue was brought from the country the grounds of which belonged to Lithuania during the rule of Vytautas the Great - Ukraine. The statue weighed nearly thirty tons. 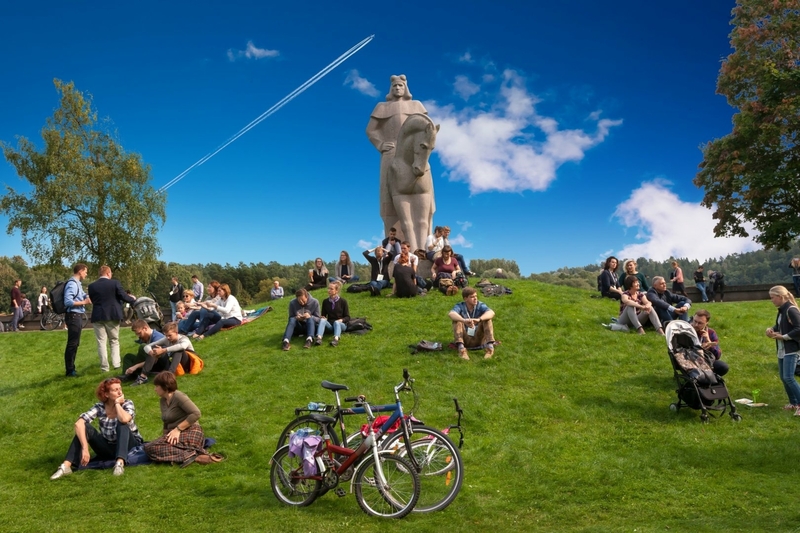 Several areas were suggested for the statue to be built in; however, the sculptor believed that the Vytautas Park, situated between the Vytautas Hill and Nemunas embankment, was the most suitable place to build it. G. Jokūbonis sculptures are characteristic of serenity and dignity - one may easily spot these features in the statue of Vytautas the Great, which portrays the duke admiring Birštonas resort.